The perfect compliment to your Berlin Gardens Classic Dining Table, or placed around a counter height End Table, our Amish Poly Comfo-Back Swivel Counter Chair is a great addition to your backyard area. Featuring a beautiful "Comfo-Back" shaped backrest and contoured seat, this swivel chair is sure to have you and your guests sitting comfortably while enjoying every opportunity for an outdoor get together! Add our optional Sunbrella cushions to add more comfort to your chairs and another styling element to your decor. The Poly Comfo-Back Swivel Counter Chair is available in an array of color and cushion options, ensuring that you find just the right chairs to match your personal style. Each chair is also hand built by skilled Amish woodworkers, in the United States, ensuring integrity and longevity in every piece. 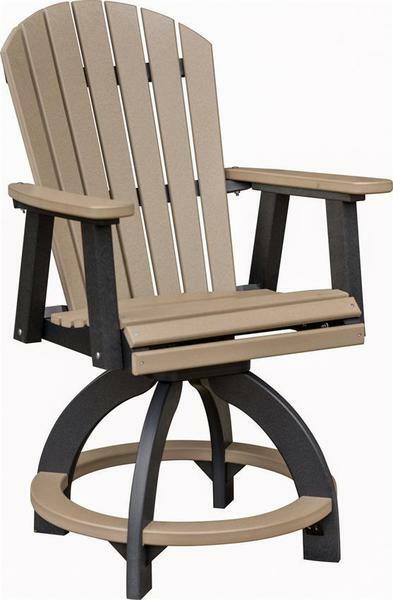 With Berlin Gardens poly furniture, you're sure to have an amazing outdoor set that will last decades! Seat Height - 22 1/2"
Arm Height - 30 1/2"